Create your own thrilling park when you play RCT! When there are no amusement parks in easy reach or the months are cold and the parks are closed, theme park enthusiasts who play Roller Coaster Tycoon can still enjoy the thrills of a theme park getaway from their own home. Each scenario presents different challenges, such as inclement weather, different guest preferences, space limitations, financial hardship, park decay, and available rides that players must overcome to successfully manage their own theme park. The first version of Roller Coaster Tycoon was introduced in March 1999. Written and designed by Chris Sawyer, the game became an instant hit not only with theme park aficionados and roller coaster enthusiasts, but also with players who enjoy the management aspects of a tycoon-style game. Two expansion packs were eventually added to the game - Corkscrew Follies and Loopy Landscapes - that introduced additional scenarios and ride types players could use. 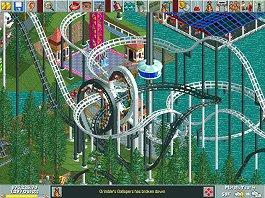 After the wild success of the original game, a second version was introduced in 2002 for players who never tired of trying new strategies to play Roller Coaster Tycoon. The second version did not differ significantly from the first except in the types of scenarios and the fact that players did not need to complete easier levels in order to unlock more difficult options. Roller Coaster Tycoon 2 also included five "real" Six Flags theme parks that players could manipulate and manage to bring their theme park dreams to life.Like its predecessor, the second version of the game also generated expansion packs. Wacky Worlds offered new scenarios based on all seven continents, and Time Twister offered more culturally-themed options based on different eras. Eager gamers could continue to manage their own parks with the release of the third version of the game in 2004. This time, Roller Coaster Tycoon was significantly different and offered more innovative 3D graphics, including a rider's point-of-view for experiencing new rides and roller coasters. Players could also design fireworks shows based on their own music, and the two expansion packs offered completely new thrills to master. Soaked! allows players to create intricate water parks, while Wild added safari and dinosaur elements to the theme park format. Whatever version of the game eager enthusiasts choose to play, there are certain tips that can help them manage a successful, profitable, and thrilling theme park. Variety: Build a wide range of rides with different durations, intensities, and styles. Guest preferences vary and a park that caters to a wide range of thrill levels will be more successful. Pricing: Experiment with different admission prices, individual ride prices, and costs for food, souvenirs, and maps. Even restrooms can have a fee, and the more money a park makes the more rides it can construct. At the same time, an expensive park may soon find it has fewer guests willing to pay high prices, so balance is an important key. Queues: No guest likes to wait in line, but constructing a queue line helps keep the park orderly and less crowded while ensuring that each ride cycle is filled with eager riders. Staffing: Always have adequate staffing for handymen (cleaners), maintenance men, and entertainers. Smaller areas can be more easily maintained, and a manager that actively supervises the staff will have a cleaner, more productive park. Weather: Different weather conditions affect which rides and foods guests are most interested in. Have indoor rides and warm foods available for rainy, cool days and water rides and plenty of drinks for the heat of summer. Landscape: Adjust landscape heights and conformations to accommodate more rides, but be aware that such construction costs are expensive. Save Rides: Save successful ride designs so they can be rebuilt quickly and easily in future parks. Theming: Add trees, bushes, benches, trash cans, and decorative objects throughout the park to improve its visual appeal and attract more guests. Construction: Even after the scenario goal is met, continue adding new features, rides, and shops to maintain the park rating and guest numbers until the time allotted expires. A park that doesn't have anything new to offer is one that will have fewer guests and less profit. Have Fun! : Competitive gamers may find themselves frustrated and distraught when a new roller coaster crashes or puddles of vomit pile up on the pathway. Remember that this is a game and is designed for entertainment, and enjoy creating the park of your dreams. The thousands of theme park fans who play Roller Coaster Tycoon have made the game one of the most successful tycoon-style games in history. With multiple versions, deluxe compilations, and expansion packs to choose from, every eager guest can find a game to simulate their best theme park vacation - or they can make their own!For more information about Roller Coaster Tycoon, including computer system requirements, updates, news, downloads, and more, visit the official website.